Hello Granny, congratulations on your first Grand Geek. I’ll assume it’s okay to say “Grand Geek” because any baby brought in by Apple Watch has got to be a Grand Geek, right? Anyway, Todd McCann from the Trucker Dump Podcast. Here’s the problem to be solved. I am apparently an idiot. I keep hearing the podcasters I listen to and any reviews I see about new podcasting apps, everything revolves around podcast playlists. For the life of me I can’t figure out why anybody would want to make a podcast playlist. I mean, music? Sure! 3 minute song, there’s a whole bunch of them, want to listen to a whole bunch in a row, I understand. Podcasts? 45 minutes, an hour, 2 hours if you’re looking at MacBreak Weekly, something like that, why would you want to make a podcast playlist when you’re only going to be looking for a new podcast every 45 minutes or so. What is the point? What am I missing? I’m going to give a short answer and then a long drawn out explanation of why this is an issue for me right now. The short answer has a few pieces to it. Todd likes long-form podcasts, as do I but not all podcasts are 45 minutes or longer. Mac OS Ken is a favorite and it’s often in the 10-15 minute length. And what if you have only 15 minutes left of a long podcast and you want to listen to the rest of it and then switch over to another show? If you’re sitting at your desk, that’s no big deal, but what if you’re driving? Please don’t tell me you look away from the road while driving and fiddle with your phone? Even just going for exercise I find it interrupts my speed walks if I have to select a new episode. Other methods let you play podcasts one after another but they don’t give you the granularity I want. Let’s say I’ve only got 15 min left of Let’s Talk Photography, and a 10 minute Daily Tech Headlines and a 30 minute Clockwise that I haven’t started. If I can put them in a playlist, in the order I want, then I can hit play, go on my run and never have to stop to find the next show. Let’s you set the start time by podcast, great if the podcaster often rambles or does ads for the first 2 minutes. I don’t mind ads but you have to earn the ad time for me, talk to me for a while before advertising! You’ll notice I’ve been slipping in and out of present and past tense; that’s not an accident. An update came out for Pocketcasts recently that has made me really cranky. They did a few annoying things, but I took to the Twitters because they took away my precious playlists. But it will say, “Your UP Next is empty”. Well that’s a big help, isn’t it? 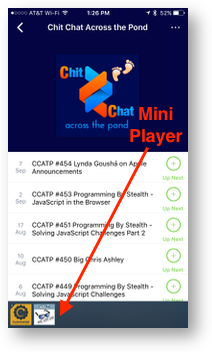 Note that while the mini player is showing the Up Next list, whatever podcast you bring up on the main part of the screen will have every Play button turn into an “Add to Up Next” button. Unfortunately this button is a pale green circle with a very thin plus inside it and in possibly even paler green text, it says “Up Next” below it. I only know what it says because Monica told me it was there, it’s positively impossible to see in broad daylight with my sunglasses on. I have to wear sunglasses because they’re bifocals so it’s the only way I can see it! There’s one more way to add an episode to Up Next. If you tap on the episode name without hitting the play button, there will be a couple of icons showing, one of which looks like 3 lines and a little + button. If you tap on it you’ve added the episode to Up Next and it changes to a check mark. Of course there’s no visual or audio feedback to tell you that it’s the UP Next list because that would take all of the challenge out if it! Once you know the trick, it’s actually easier than using a playlist, and very pleasing visually. I ran some tests with VoiceOver and with Lino Morales’ help I was able to figure out how to trigger a long press and it worked reasonably well. The only thing that didn’t work was when you’re in the Up Next list, you can’t hear the name of the podcast episodes so it would be kind of hard to rearrange them. On the old version of Pocketcasts, if you tried to download an episode you hadn’t yet downloaded, you’d get an option to Stream. It would warn you if you were on WiFi which was a nice touch. Unfortunately the stream option seemed to also have been removed. I was having to download and stand around waiting for it before I could start exercising or driving. Since I had Monica’s ear, I decided to complain to her about the missing stream function. Well again the feature wasn’t gone but it was hidden. 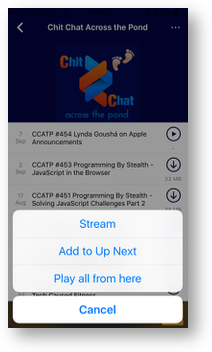 If you haven’t yet downloaded a podcast, a tap and hold on an episode name and now you’ll see Stream along with Add to Up Next. Pocketcasts is still my podcatcher of choice on the iPhone but if it weren’t for Monica I would have bailed on the app. I’m thinking maybe the developers are of the generation that thought up the Snapchat and Pokémon interfaces where secret gestures you can only learn by word of mouth make them hard for adults? Anyway, that’s my long answer to Todd’s question of “why do you care about playlists”. Allison summed it up very well. I don’t use play lists often but there are some shorter podcasts that I may not listen to regularly but periodically want to catch-up on and use playlists for that. I use the PocketCasts up-next feature for exactly the same thing. Shorter shows like MacOS Ken or the Quick & Dirty Tips crew require lots of extra interaction with the phone. The biggest reason for setting this up is to have a list of queued up content while driving, doing chores or being out of the house. Being able to ignore the phone for an extended stretch is often a nice-to-have. Have you used Overcast? I moved over to it shortly after it became available. Marco Arment the app’s developer has moved around trying various pricing models and then made it free/in-app donation but just a few days ago made it an annual subscription to remove ads which has people upset. I had been a former premium user (before it went free for all features) so when I clicked restore purchases, the ads went away. Not sure if this will be for a year or lifetime but we’ll see. Anyway, it is a terrific podcast app and does playlists among many other great features. If you have used it, I would love to hear why you prefer PocketCasts to it.